You know those fabulous rotisserie chickens you get at the grocery store? 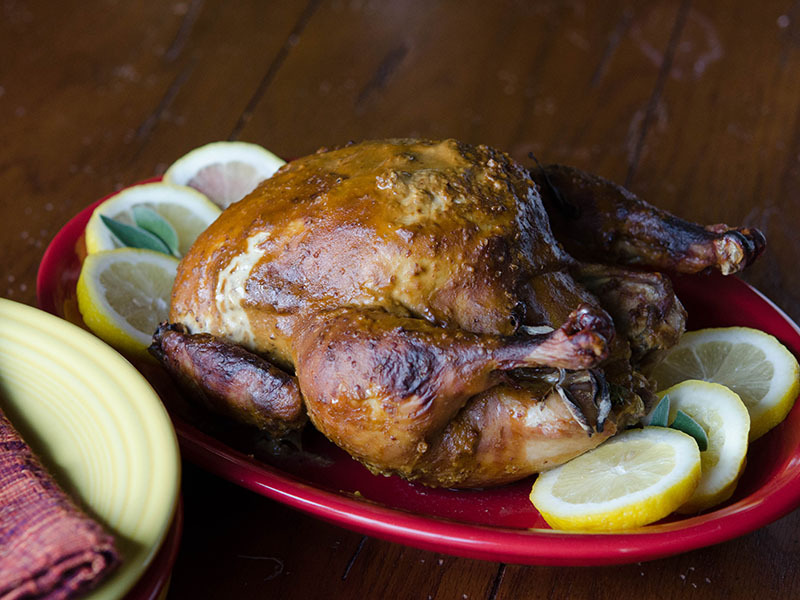 Did you know that you can make one at home without even having a rotisserie? 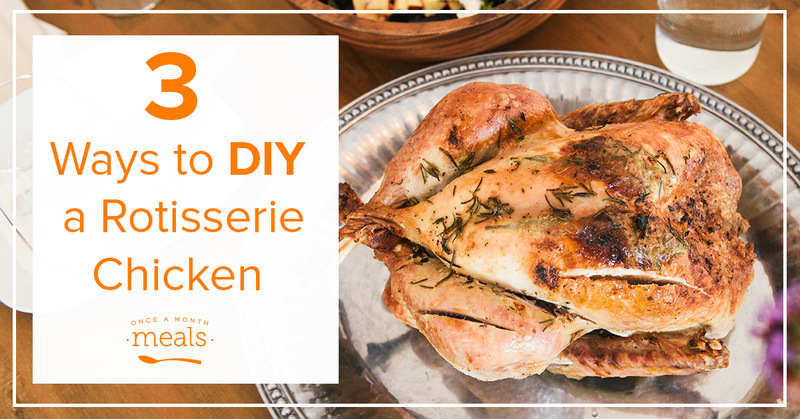 You can save yourself a trip to the grocery store and a good deal of money by purchasing a whole chicken and prepping it at home using one of these three easy DIY methods. Just pick your favorite appliance or make a decision based on the time you have available. 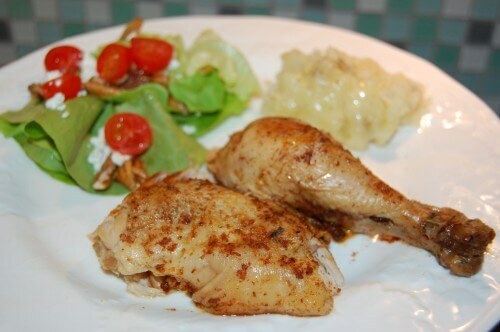 Meanwhile, season the chicken with your favorite spices, such as salt, pepper, garlic powder, parsley, paprika, etc. For extra flavor, rub the spices under the skin instead of just sprinkling. Turn the chicken breast side down. Using sharp kitchen shears, cut along both sides of the backbone, cutting through the ribs. Remove the backbone and giblets (you can save these for stock or other purposes if you like or simply discard). Turn the chicken back over and pull back the breasts (you will hear some bones crack) so that it lays completely flat. This will speed up your cooking time and allow all parts of the chicken to be cooked evenly. Pour 1-2 cups of liquid (water, broth, or white wine) into the bottom of a roasting pan. Set the chicken on a roasting rack or directly on the pan. Drizzle some olive oil on top of the chicken. Bake for one hour and check for doneness (skin should be browned and crisp and internal temperature should be 165 or juices will run clear). If the meat is not quite up to temperature, cover the breast portion with foil to keep it moist and bake another 15 minutes. Or add one of these tasty roasted chicken recipes to your next freezer cooking menu: Ridiculously Delicious Roast Chicken or Seaton Sunday Roast. Create a rack in your slow cooker to lift the chicken out of the juices (this will keep it falling apart so it will look pretty on the plate.) If you want to add some extra flavor you can use chunks of onion, carrot or other root veggies. Or you can simply make 3-4, 1-inch round foil balls and place them in the bottom of the slow cooker. Place the whole chicken, breast side up, on the foil balls. Season with your favorite spices, such as salt, pepper, garlic powder, parsley, paprika, etc. For extra flavor, rub the spices under the skin instead of just sprinkling. Cook the chicken on HIGH for 4-5 hours or on LOW for 6-8 hours. You want the chicken to reach an internal temperature of 165 degrees, but not overcook. Remove it carefully from the slow cooker to keep it in one piece. I usually need two large spoons. You can serve it immediately, or if you like a crispy skin, you can place it under the broiler in your oven until the skin is golden brown. Mix desired spices in a bowl. Rub spice mixture all over the meat by sliding your hand underneath the skin. Reserve just a little bit to rub on the outside of the skin. Place a trivet in the bottom of the inner pot. Place one cup of liquid in the bottom and place the bird on top. Cook on poultry setting for 32 minutes or for 6 minutes per pound plus 2 additional minutes. Remove it carefully using the trivet handles. You can serve it immediately, or if you like a crispy skin, you can place it under the broiler in your oven until the skin is golden brown. How do I make my DIY rotisserie chicken a freezer meal? For any of these recipes, you can do this two ways. It just depends on your schedule and how you want to use the chicken. First, you can prep and season the chicken and freeze it. Then thaw and slow cook for the serving day. Or you can cook the chicken, shred it, and freeze it in recipe portions for easy meals another day. The easiest thing to do is to add one of these fantastic recipe suggestions to your next custom freezer cooking menu!